Desert Star, which uses the Waldorf approach, is located on three acres in Cornville, Arizona where children feel connected with the natural cycles of life and there is ample space for play and work in their organic garden. Kids tend their plants in the schoolyard. 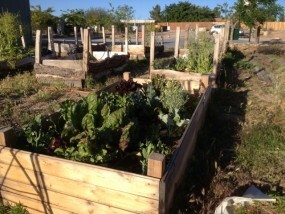 The Winn Community Garden – One plot for each class. The garden is an integral part of their education that emphasizes “head, heart and hands” and provides children a place to integrate and retain what they learn through experiential, multi-sensory and emotionally engaging learning experiences. The children are involved in activities including designing, planting, and maintaining gardens; harvesting, preparing, and sharing food; working cooperatively in groups; learning about science and nutrition; and creating art and stories inspired by their gardens. This entry was posted on Thursday, August 28th, 2014 at 7:30 am. 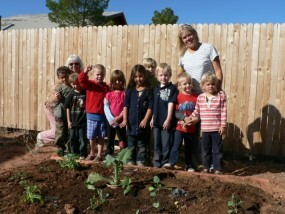 It is filed under Desert Star School Garden, SCHOOL GARDENS PROGRAM. You can follow any responses to this entry through the RSS 2.0 feed.